Nintendo has released update hardware life to date sales figures. According to figures released in Nintendo’s latest financial briefing, the 3DS has sold over 50 million units, and spawned 215 million software sales. The poor old Wii U is still languishing at under 10 million hardware sales, with 52 million software sales to its name. Nintendo provided historical sales figures, too, and it’s sad to see the Wii U has the lowest figures of any system to date. Of course it has many years ahead of it, but the market for games is much larger now, so it’s a little depressing. 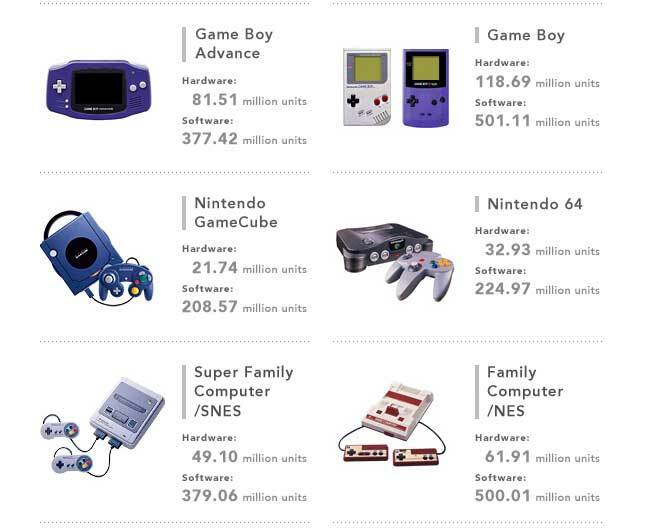 I’m actually surprised to see how few units the N64 and Gamecube sold compared to earlier and later consoles; it’s easy to forget that the advent of the PlayStation and later the Xbox disrupted an industry previously dominated by Sega and Nintendo. Look at that DS though. Dang. It once held the record for most units sold of any console, but the PS2 overtook it in 2012.